This image shows water frozen solid within a carbon nanotube at high temperatures that would normally set it boiling. Image courtesy of the researchers. Everyone knows that, at sea level, water starts to boil at a temperature of 100°C (212°F). And scientists have long observed that when water is confined in very small spaces, its boiling and freezing points can change a bit, usually dropping by around 10°C or so. Now, however, a team at Massachusetts Institute of Technology (MIT) has found a completely unexpected set of changes. Inside the tiniest of spaces – in carbon nanotubes whose inner dimensions are not much bigger than a few water molecules – water can freeze solid even at high temperatures that would normally set it boiling. This discovery illustrates how even very familiar materials can drastically change their behavior when trapped inside structures measured in nanometers, or billionths of a meter. This finding might lead to applications such as ice-filled wires that take advantage of the unique electrical and thermal properties of ice able to remain stable at room temperature. The work is reported in a paper in Nature Nanotechnology by Michael Strano, professor in chemical engineering at MIT, postdoc Kumar Agrawal, and three others. "If you confine a fluid to a nanocavity, you can actually distort its phase behavior," Strano says, referring to how and when a substance changes between solid, liquid and gas phases. Such distortions in phase behavior were expected for ice in carbon nanotubes, but the enormous magnitude of the change and its direction (raising rather than lowering the freezing point) were a complete surprise. In one of the team's tests, the water solidified at a temperature of 105°C or more. The exact temperature proved hard to determine, but 105°C was considered the minimum value; the actual temperature could have been as high as 151°C. "The effect is much greater than anyone had anticipated," asserts Strano. The researchers found that the precise change in the behavior of water inside the tiny carbon nanotubes – structures the shape of a soda straw made entirely of carbon atoms but only a few nanometers in diameter – depends crucially on the exact diameter of the tubes. "These are really the smallest pipes you could think of," Strano says. In the experiments, the nanotubes were left open at both ends, with reservoirs of water at each opening. Even a tiny difference in the width of the nanotubes (1.05nm vs 1.06nm) produced a difference of tens of degrees in the apparent freezing point, the researchers found. Such extreme differences were completely unexpected. "All bets are off when you get really small," Strano says. "It's really an unexplored space." In earlier efforts to understand how water and other fluids would behave when confined to such small spaces, "there were some simulations that showed really contradictory results," Strano says. Part of the reason for that is many teams weren't able to measure the exact sizes of their carbon nanotubes so precisely, not realizing that such small differences could produce such different outcomes. In fact, it's surprising that water can even enter these tiny tubes in the first place. Carbon nanotubes are thought to be hydrophobic, or water-repelling, so water molecules should have a hard time getting inside. Exactly how they’re able to gain entry remains a bit of a mystery, says Strano. 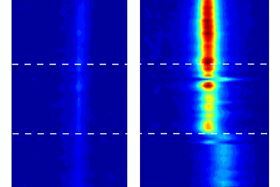 Strano and his team used a highly sensitive analytical technique called vibrational spectroscopy to track the movement of water inside the nanotubes, thus making its behavior subject to detailed measurement for the first time. The team could detect not only the presence of water in the tube, but also its phase. "We can tell if it's vapor or liquid, and we can tell if it's in a stiff phase," says Strano. While the water definitely goes into a solid phase, the team avoids calling it ‘ice’ because that term implies a certain kind of crystalline structure, which they haven't yet been able to show conclusively exists in these confined spaces. "It's not necessarily ice, but it's an ice-like phase," Strano says. Because this solid water doesn't melt until well above the normal boiling point of water, it should remain perfectly stable indefinitely under room-temperature conditions. That makes it a potentially useful material for a variety of possible applications. For example, it should be possible to make ‘ice wires’ that would be among the best known carriers of protons, because water conducts protons at least 10 times more readily than typical conductive materials. "This gives us very stable water wires, at room temperature," Strano says.